in six languages. Since then we have been receiving constant positive feedback from our users, who appreciate the improved site navigation and new forms of content, as well as high quality of discussions and the presence of knowledgeable AdWords professionals. This encouraged us to continue rolling out the new AdWords Community platform to more languages. In June we launched the site in Italian, and today we are glad to announce that AdWords Community is now available in Traditional Chinese. 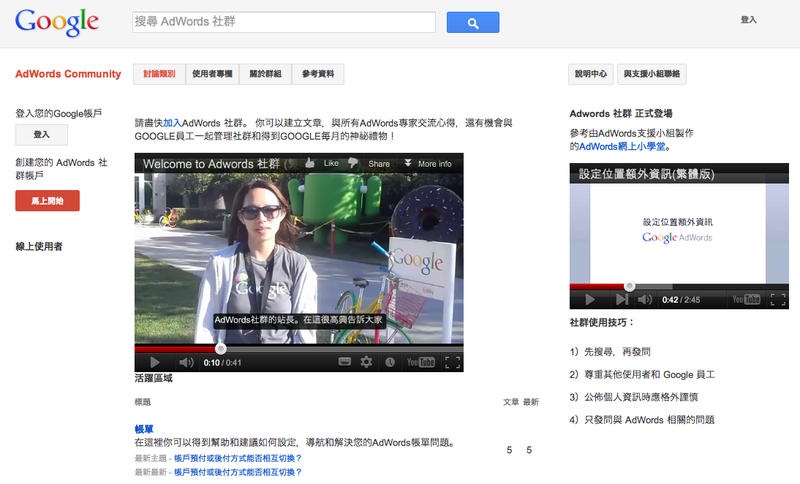 The new Adwords 社群 caters to all AdWords advertisers who speak Traditional Chinese. This is a big step towards helping AdWords customers get the best out of AdWords and out of the web, an opportunity to learn more about online marketing and usage of AdWords by exchanging advice, ideas and best practices. Now in addition to getting professional help via email, phone, chat or Help Center, advertisers who speak Traditional Chinese can connect online with AdWords professionals, other advertisers and Google employees. You can visit, search and browse the new AdWords 社群 without registration. If you want to ask a question, simply log in with your Google Account and choose a username. We hope you will enjoy the social interactions and the wealth of business knowledge that will be available on this new Community! In February 2012, we launched the AdWords Community in six languages. Since then we have been receiving constant positive feedback from our users, who appreciate the improved site navigation and new forms of content, as well as high quality of discussions and the presence of knowledgeable AdWords professionals. This encouraged us to continue rolling out the new AdWords Community platform to more languages. In June we launched the site in Italian, and today we are glad to announce that AdWords Community is now available in Traditional Chinese.